This isn't right... take a look at my screenshot of the Document menu. Add Page, Next Page and Previous page all use the arrow key, but none of those keyboard shortcuts work. Now open Preferences and look in Keyboard Shortcuts... the shortcut is not a regular arrow there which you can see in my second screenshot (I already changed Next Page by the time I took the screenshot). If I retype each keyboard shortcut then it uses the correct arrow and the keyboard shortcuts work. I don't know what the intent was for those keyboard shortcuts - either they are wrong in Preferences or the Mac menu is not displaying it correctly. I'm not even sure what to press to get that kind of arrow! 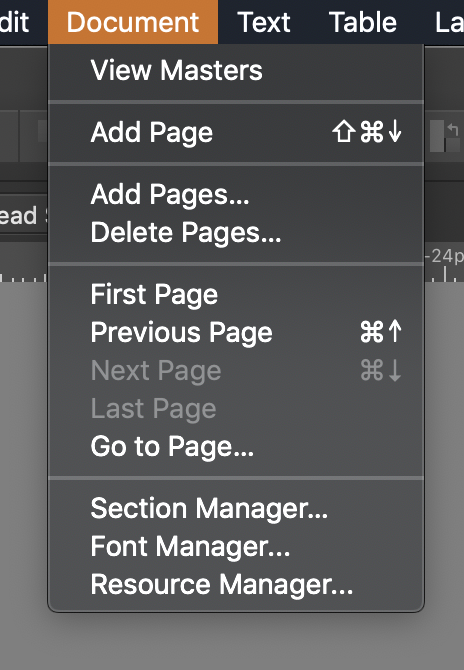 Not sure what is different but my Document menu is showing the funky arrows for all three options and they seem to represent Page Up and Page Down - using those keys the shortcuts work for me. Page Up and Page Down keys work here as well, although there's a different symbol on my extended keyboard which just shows a plain arrow. Looking at the Keyboard Shortcuts preferences, there seems to be some trouble displaying that glyph, although it appears ok in the Document menu. Ahh thanks guys, so it should be page down. The problem is the Document menu only shows it to be a regular arrow, not that funky arrow, so I was trying the arrow keys. Not sure if that's a Publisher bug or OS bug. 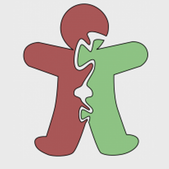 I also found another funky right-arrow for Toggle UI. Not sure that it's supposed to be. Yes, that is confusing. I had not got around to using those keyboard shortcuts, but would have used the normal arrow keys (which don't work). Should there not be a better/different symbol showing in the Document menu for the Page Down or Page Up? Can't say I remember any other software using those keys for a shortcut (other than their normal function), so can't say I have had a chance to see a symbol for them. In the Prefs/Keyboard Shortcuts I also get the question-mark in a box symbol for those menu items, so again, not very informative. But in the end, nice to know how to finally get Page Down/Up to work! I think instead of some of those symbols it should SAY what they are, like Page Up, page Down, Tab etc. So if the developers are reading this, this is a sort of bug / suggestion. 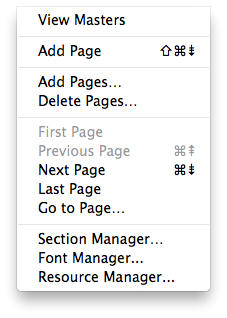 Those symbols are rather cryptic but they are the correct symbols for Page Up and Page Down (see here for other macOS symbols). The symbol on my keyboard is just a plain arrow which doesn't help, but that's an Apple decision. Compact keyboards use fn-Up Arrow. 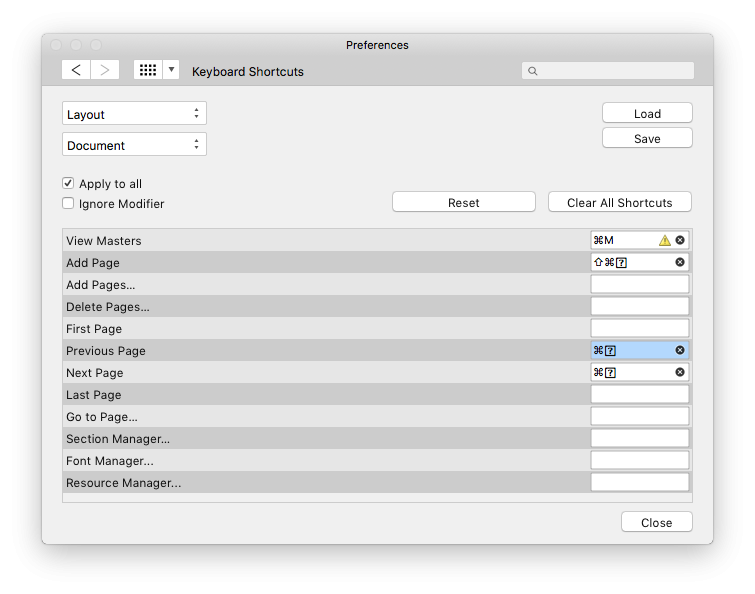 The only glitch in Publisher is the missing glyph symbol in the Keyboard Shortcuts preferences. 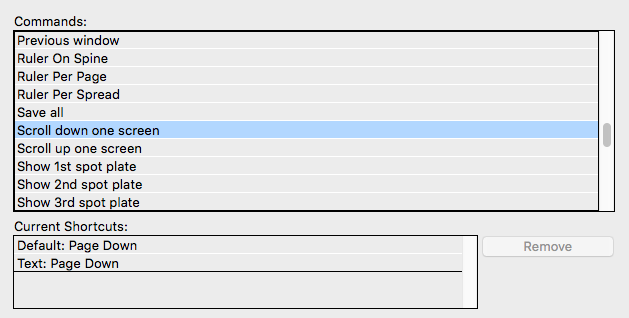 If I type Command-Page Up into the preferences, the symbol appears as expected. Not sure why it's not showing by default. There is still the glitch of the wrong symbol showing up in the menu itself, at least on the Mac. It appears as a regular arrow there, which is wrong and which is what made me think the shortcut wasn't working in the first place. You could experiment and try Preferences, Keyboard Shortcuts, Reset. Or Preferences, Keyboard Shortcuts, Miscellaneous, Reset User Defaults. One of them might help, but of course you'll need to recreate any shortcuts that you have changed. This is a known issue with development - I've just bumped it with them! Seems like a problem with Apple's new system font. It shows arrows with double stroke on my 10.9 system, which are easily distinguishable from normal arrows. Anyone running High Sierra and/or Mojave and can report what they see? On High Sierra the drop-down menu shows a normal up or down arrow. In prefs/shortcuts it shows a double-headed arrow for both. No real way to tell that it's referring to either Page Up or Page Down. So the bug is in High Sierra and later. And my suggestion, because most people wouldn't be able to tell that the symbols are Page Up/Down, is to write out the keyboard shortcut instead of using the symbols. So Command or cmd for short, Option and so forth. See how InDesign does it in the screenshot.